I have a minor obsession with office supplies. Last Saturday, I went to a peddler's mall with my parents, and found this fantastic, all-metal, made-in-the-USA Swingline stapler. Price? 1.49. You can't beat that! I'm sitting at my desk looking at two plastic staplers I paid more for and don't like nearly as much; plus, they are both plastic. 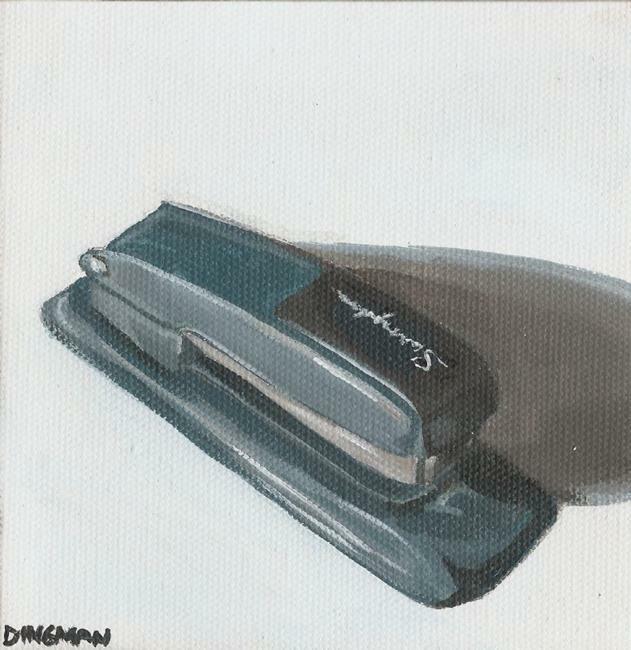 So, naturally, I thought this new mini-size stapler would be a perfect subject for a quick, but effective, painting. I began by filling in the darkest part of the shadow, working outward to a lighter shadow which pulled in the coloring of the stapler. I chose to leave the setting snowy white, which gives the small stapler a sense of weight. After blocking in the colors, I highlighted the stapler's body with a very light version of the main stapler color, bringing the very brightest highlights out with a very slightly tinted white. I roughed in the "Swingline" name just enough to make it recognizable.